Ever had your Google Product Listing Ads not show up in search or your campaigns were suspended because your titles didn’t meet Google’s requirements? There are many areas of your Google Shopping feed you can spend time optimizing. The best place to start is with your product titles. Not that other parts of the feed like description, category and images aren’t important, but for improved CTR and compliance to Google Shopping’s matching algorithm, titles are where it’s at. The first step to optimizing your Google Shopping titles is to become familiar with Google Shopping title requirements. Be specific. Include the brand, gender, designer, color and name of the product that is displayed on your website. Google will match the title from the website landing page to the product ad title. How would someone search for a product like yours? The more information you can provide the easier it is for Google Shopping to match your products with their search results. As stated by Google, these are the requirements for title structure for all products. Always go from left to right in order of importance. The most relevant information should be on the left as Google weighs the first few terms more heavily as CPC Strategy concluded based on their research. In this search result, brand, name, and color are the most important variables in the product listing results. For products that aren’t filtered in Google Shopping by brand, you might want to focus on other important descriptors like gender, the product itself, color and size. Even including the type of fabric can help narrow down a search or give you an edge against a competitor who included less information in the title of a competing product. Simple is best when naming your products. Note that in the above example the advertiser used practical names like “jackets” and “blazer” to include in the title of the product and “red” as the color name. For instance, most searchers are not looking for colors like “crimson” when looking for a “red” blazer. 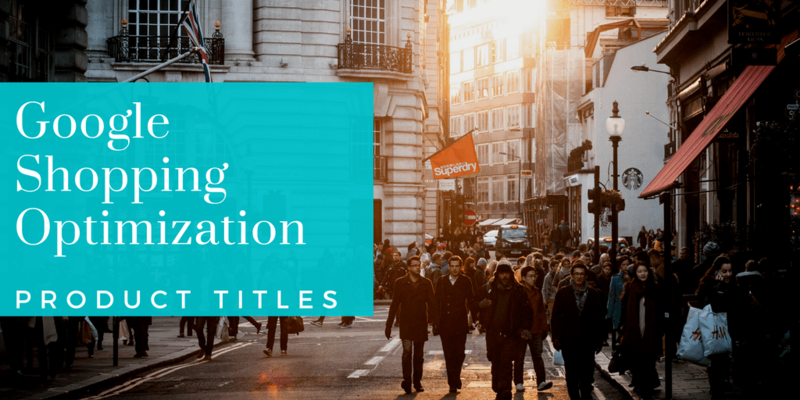 Fine tuning and testing your titles can make a difference in your product listing visibility. A simple way to get title keyword ideas is to click on AdWords Dimensions and choose “Search Terms” to pull up your campaign’s search query report. This report can provide useful keyword ideas to include in your title or it can tell you something simple like adding an “s” to a product name like “Party dresses” instead of “Party dress”. Google Shopping Product Title optimization is not an exact science but when in doubt always refer to Google’s product data specifications. If you have questions that aren’t answered in this post try some of these links for answers from Google. Let us know your experience with fine tuning your Google Shopping titles in the comments. Stay tuned for our upcoming Google Shopping Color Optimization blog post for more information on color optimization. Contact Highstreet.io to set-up and manage your Google Shopping product feed. We have a wealth of experience with maximizing your shopping campaign performance in the areas of fashion, apparel, consumer electronics and household item products listings.